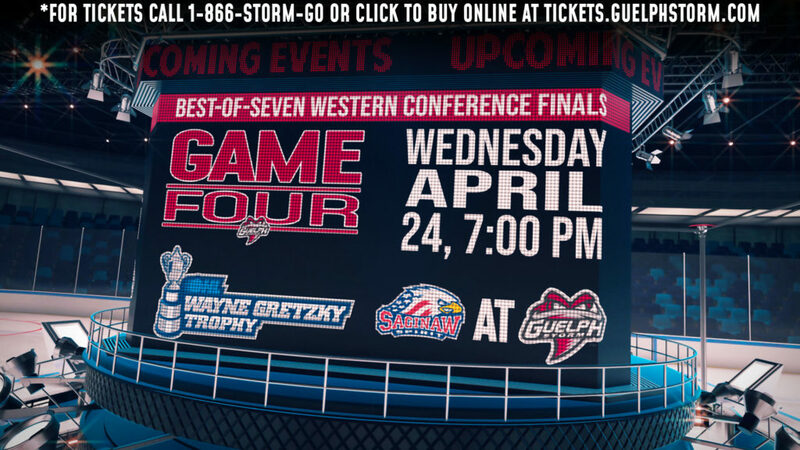 Toronto, ON – The Ontario Hockey League today announced that defenceman Garrett McFadden of the Guelph Storm is the 2017-18 recipient of the Dan Snyder Memorial Trophy awarded annually to the OHL’s Humanitarian of the Year. McFadden becomes the league’s first two-time award recipient winning for a second straight season with the continuation of his program ‘McFadden’s Movement’ in support of youth mental health awareness. The initiative took new heights in 2017-18 with the introduction of an Ambassadors Program along with fundraising efforts that totaled $20,000 to local mental health resources. “It’s a tremendous honour to be recognized as the Dan Snyder Humanitarian of the Year,” McFadden said. “The OHL and every person involved in my junior hockey career have all played a huge role in allowing me to be the person I am today. Without the help and guidance of these people, being recognized for this award would not be possible. The Storm captain introduced ‘McFadden’s Movement’ in September, 2016, as a campaign striving to change, help, and develop mental health among athletes. Directly affected by the loss of a close family friend, Wes Cameron, to suicide in 2011, McFadden has drawn on his own challenges when connecting with youth. This season’s MM27 Ambassadors Program encouraged Storm teammates and elite athletes from across the province to open up and share their own stories about mental health. This inspired community youth to do the same with an online portal on the McFadden’s Movement website that accepts digitally submitted mental health stories. Over 30 Ambassadors ranging from ages four to their mid-20’s opened up and shared personal experiences such as dealing with the emotions of changing schools, losing friends to suicide, long-term health disorders impacting their mental health, and facing mental health obstacles. As part of his community outreach, ‘McFadden’s Movement Ambassadors of the Game’ were invited to attend a Storm game as McFadden’s guest, meet with him post-game, and share their connection on the program’s website. The $20,000 raised by McFadden’s Movement fundraising programs and corporate partnership support more than triples his donation from 2016-17, and has been split between WES for Youth Online (a free youth online counseling service created in memory of McFadden’s family friend), and the Canadian Mental Health Association Waterloo-Wellington Branch. 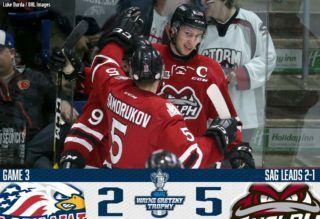 A 20-year-old from Kincardine, Ont., McFadden played five full seasons with the Storm as the club’s first round pick in the 2013 OHL Priority Selection. 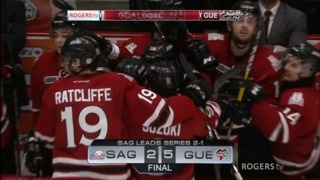 He won an OHL championship with the club as a rookie in 2014 and has accumulated 147 points in 292 games including a career-high 44 points in 68 games this season. 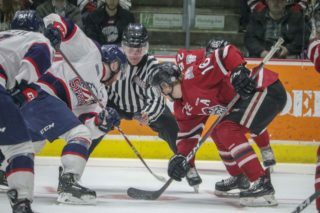 The two-year captain and University of Guelph student has been the team’s Humanitarian of the Year in three of his five seasons and remains the only Storm player to win the league’s award since it was first presented in 1993. 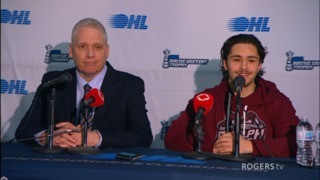 Each year the OHL awards a player that has demonstrated outstanding qualities as a positive role model in the community with the Dan Snyder Memorial Trophy. The Ontario Hockey League Board of Governors announced in 2004 that the OHL Humanitarian of the Year award would be renamed in recognition of the former Owen Sound Platers captain, who was twice named his team’s Humanitarian of the Year in recognition of his tremendous efforts in supporting community activities. Past recipients include Chris Terry and Ryan Hayes who represented the Plymouth Whalers with back-to-back awards in 2009 and 2010 respectively, before Jack Walchessen and Andrew D’Agostini of the Peterborough Petes won in 2011 and 2012. Ben Fanelli (Kitchener 2013), Scott Simmonds (Belleville 2014), Nick Paul (North Bay 2015), and Will Petschenig (Saginaw 2016) are the most recent award recipients. Of the 20 nominees submitted by member clubs this season, an impressive six including McFadden, were repeat candidates who all contributed admirably to their communities. In Hamilton, defenceman Jack Hanley was once again a leader for the Bulldogs in their anti-bullying campaign and made regular visits to McMaster Children’s Hospital. Frontenacs’ defenceman Liam Murray put Alzheimer’s Disease at centre ice this season becoming a Youth Ambassador for Kingston’s Alzheimer Society sharing his personal experiences with his grandfather at education sessions, school visits, and other Society activities. Oshawa Generals captain Jack Studnicka created his ‘Skate in Strides’ program to help raise funds for Cystic Fibrosis Canada. In Sarnia, Nick Grima was once again instrumental in helping the Sting hold their third annual First Responder’s Night in support of the program #IveGotYourBack911. And hometown hero Michael DiPietro continued to champion local outreach programs for the Windsor Spitfires contributing largely to the success of ‘Super Hero Night’ in support of the ‘Fight Like Mason Foundation’. McFadden will be formally presented with the Dan Snyder Memorial Trophy at the 2018 OHL Awards Ceremony which takes place on Wednesday June 6 at the Hockey Hall of Fame in Toronto. He will also be the OHL’s nominee for Humanitarian of the Year at the annual CHL Awards presented on Saturday May 26 at the 2018 Mastercard Memorial Cup in Regina. For more information you can follow @McFaddensMvmnt or visit www.mcfaddensmovement.com to support the cause.